With the elimination of the Type 91, the Japanese apparently still wanted a multi-role hand & rifle grenade. This role was filled by the introduction of the Type 99 grenade and the Type 100 Cup Discharger. The first examples of these were obtained after the Japanese occupation of Kiska Island in the Aleutians in 1942. This gave rise to its nick-name the "Kiska Grenade". The fuze is a percussion delay, as with the 91 & 97 Types. It is operated by removing the safety pin and hitting the cap hard to start the delay. Earlier Type 99's had a paper instruction label with graphics and text showing its use. The fuze on this one is dated May 1942. Anyone have a picture of the complete label? The Type 99 fuze is distinctly different from its predecessors. The retaining cap and fuze body no longer have the indent retaining features. Instead, there is a small retaining screw that sits in an oval cut in the side of the (now solid) cap. Creep spring is still present. The screw-in firing pin feature was removed and replaced by a solid assembly. Crossed cannons logo for the Osaka Army Arsenal. Japanese dates are read right to left on grenade fuzes. The first character on the right is "Showa" then 10 and 8 (Hirohito's 18th year), which is 1943 on our calendar. 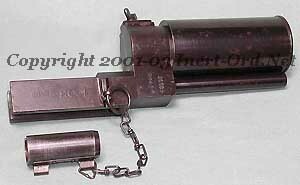 This is the Type 100 Cup Discharger used to fire the Type 99 Grenade. Interesting design using a gas trap system. The grenade was placed into the cup (base down, pin pulled) and a standard service cartridge was fired. 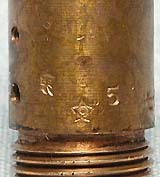 As the bullet exited the muzzle, it passed through the small tube and pressure was directed up into the base of the large cup, which launched the grenade. The momentum shock of firing would set the delay fuze. Impressed with the German cup discharger design, the Japanese developed their own copy (Type 2), as a lighter alternative, which was introduced late in WWII. 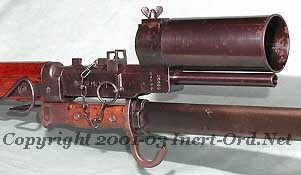 The Type 100 Grenade Launcher mounted to the Type 99 Short Rifle.